Dharamsala February 14, 1981, 6:00 a.m. The Dalai Lama sits on his throne in the Central Cathedral. Outside, the night is black and still. A cold breeze blows down from Mun Peak. Two old women, up before dawn, circumambulate the temple. They cannot see within. The building’s curtains have been tightly drawn, its front door locked, its side doors guarded by a watchful group of monks. Only a hint of the bright electric light inside appears around the border of each window. The morning’s proceedings are of the utmost secrecy. No outsider, Tibetan or otherwise, is permitted to view them. Except for the participants, few even know they are taking place. The principal monk has already engaged in extensive preparations. For two days the members of his monastery have recited prayers while he has laboured to purify mind and body. His daily meditation practice has been conducted with special care. Fish, pork, garlic, onions and other impure foods have been eliminated from his diet. He has eaten from his own set of plates, kept separate from the others in the monastery. To complete his cleansing, blessed saffron water has been poured over the crown of his head and mantras recited. On rising this morning, four attendants help the monk dress. His plain habit is put aside for an elaborate costume store in two trunks. Ordinary pants are donned, followed by red brocade trousers, whose legs are six feet wide. It takes seven folds before the pads sewn into the garment are positioned at the knees. Fastened at the ankles, the trousers bulge a foot to each side. Matched by a red silk shirt placed over an undershirt, they are followed by two heavy robes loosely fastened with a belt and covered by a thick piece of brocade with an opening for the head. The monk’s knee high white leather boots are then tied on, toes curled up, wrathful eyes of crimson silk appliquéd on the ankles. So attired, he is helped into a jeep parked between his monastery and the Library of Tibetan Works and Archives in the Secretariat compound. In darkness, the jeep slowly winds its way over the back road, through McLeod Ganj and down the approach to the Central Cathedral. From here he is escorted up the building’s front and into a small room in the rear, where preparations continue. A triangular jerkin fashioned of gold-leafed ringlets and styled in the manner of ancient Tibetan mail is put on, its points, front and back, ending in a twist. Next, a type of backpack is securely fastened about his middle. It supports four flags interspersed with three victory banners. The flags, made of doubled-up brocade, hang from flexible metal poles and run the full length of the monk’s back; the banners, shaped like a roll of umbrellas ascend from mid-thigh to above the head and are crowned with the golden points. His sleeves are now bound with strips of red cloth; the left one, padded with archery, is stitched with three more scarlet eyes. Then a front piece of exquisite yellow, gold and red silk, its base exploding in hundreds of rainbow-hued threads, conceals all. At its center lies a golden mirror, the cardinal points dotted by clusters of turquoise around an amethyst, its polished silver core emblazoned with the Sanskrit mantra of a tantric deity. A three-foot-long silver sheath and sword are buckled on the left side, a golden quiver filled with arrows on the right; a golden thimble, used when drawing back a bowstring, is slipped over the right thumb. These are the accoutrements of an epic Tibetan warrior, a hero from the days of Gesar of Ling, Tibet’s legendary king. But despite the martial nature of uniform, the monk is not going into combat. Rather, in a few minutes’ time, as he sits beneath the bright lights of the cathedral, his consciousness will be cast aside in trance and replaced with that of Dorje Drakden – “The Renowned Immutable One” – chief spirit minister and bearer of counsel for the State Oracle of Tibet. More than a week ago the three days of the New Year’s celebrations were concluded, and now, as it has for centuries, comes the first official trance of the year. 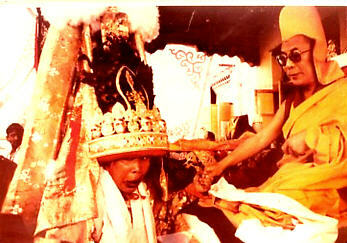 His Holiness the Dalai Lama with the spirit minister Nechung Dorje Drakden in full trance of the monk medium. Inside the Cathedral’s main hall, the Dalai Lama remains wrapped in silence. A giant statue of the Buddha rises behind his throne; images of Tibet’s patron saints crowd the raised level at the head of the hall, where he sits. They are illuminated by large butter lamps, yet the chamber’s darkness is far more radically dispelled by one hundred electric bulbs arranged, as offerings, in the shape of tiered cones on either side of the throne. Under their exacting glare, the varnished floorboards of the lower level give an almost antiseptic definition to the cathedral. But not entirely. Seven-foot spears, painted with scarlet eyes, are roped to the hall’s front pillars. Behind them, two files of young monks from Nechung Monastery bear musical instruments at the ready, while a table nearby supports dough offering or tsog and another holds a long bow and sword next to a banner-festooned helmet. The helmet, made of gold-coated iron, is almost three feet high. Five pearl-toothed ruby-eyed skulls adorn it façade beneath a crest of bear fur, surrounded by peacock feathers, and fronted by a flaming sword symbolizing penetrative insight into the ultimate nature of reality. The helmet’s rear supports nine three-foot-long flags and banners stitched with silver bells. The top of the highest is crowned by a small group of golden bells and framed by a aureoles of white cotton circling the three jewels of the Buddha, Dharma and Sangha, engraved in gold. Beside it lies a second helmet, belonging to the Gadong Oracle, who will also appear in trance this morning. The Dalai Lama’s contemplative mood is matched by that of the ministers of his Cabinet, the Chairman and Vice-Chairman of the People’s Deputies and their secretaries, all seated on low cushions to his left. A select group of abbots and lamas, their demeanour equally subdued, face them from across the way. The ceremony begins. Two ten-foot thungchen or long horns produce a shattering blast. They are followed by the shrill notes of the gyaling, accompanied by cymbals, drums and monks’ recitation, invoking the oracular deity to descend into the kuden or “receiving body”. A maroon curtain at the side of the temple parts. Three assistants appear, supporting the medium. He can barely walk. Altogether the eight layers of his clothing weigh more than a hundred pounds; the helmet, though only a third the weight of that used in Tibet, another thirty pounds. But it is not only his costume that makes it difficult for the Nechung kuden to move unassisted. He is already starting to enter the first levels of trance. A slight quivering rolls up and down his body. His breathing is short and loud. Between gaps in the music and prayers, its sound fills the room. As he walks forward, the kedun’s close-cropped head looks small and fragile above the costume’s great bulk. His cheekbones jut out fiercely; his eyes are tucked in on the shelf of the skull and have a wild, startled look. The bushy left eyebrow points at an angle to the bridge of the nose, suggesting a crooked gaze of an Iroquois false-face mask. Like a false face, the cheeks also balloon above a large overbite, the lips protrude and the entire left side of the face has slipped a notch below the right, except where the mouth curls subtly up to produce a soft, quizzical smile. Soon a more severe distortion sets in. The skin draws tight on the skull, effacing the features. The whole countenance becomes clear and pure. The medium assumes a piercing, distant look. He is immersed in the visualization of himself as a tutelary deity standing at the center of a celestial mansion; without this meditation, he is unsuitable for possession. Guided down the steps of the cathedral’s main floor, the kuden sits on a brocade-covered camp stool placed over an imitation tiger skin in the middle of the room. An attendant bolsters him beneath either arm and the third man, holding the helmet, presses hard against his back to give further support. Legs wide apart, the Nechung kuden looks up to the Dalai Lama twenty feet away, whereupon his breathing quickens. The moment has come. The first prayer cycle concludes, the second commences, once more summoning the spirit minister Dorje Drakden to descend from the “inconceivable mansion” of the protective deity at the heart of “illimitable space” and enter the receiving body. The long horns’ thunder shakes the temple’s walls and the trance deepens profoundly. The kuden begins to be possessed. Abruptly, his head jerks back to the right and he commences to hyperventilate, at an immense rate. Each breath is ejected in a compressed hiss, like a radiator venting. The speed increases and he starts to gag violently. It is as if a long cord, running the length of his torso, is being tightly twisted, pushing breath and mind further out of the body with every bend. Suddenly both legs spring off the floor and begin to leap up and down. The medium’s figure visibly expands, swelling two inches, so that the belts of the costume, purposely left loose before, now cut into the robes. The heartbeat is such that, in a separate movement all to itself, the mirror on his chest bounces. Recognising that the Choekyong or Protector of Religion has come, the attendant holding the helmet quickly places it on the medium’s head. As he does, the medium’s face turns bright red, his legs stick straight out and his head falls backwards. All three monks struggle to secure the helmet while the umze or chant leader brings the recitation to a quick stop. For a minute or two, only music is heard. When the trance concludes, the special slipknot used in tying on the helmet must be instantly released or the medium will die; it is a skill the attendants practice for days at a time, tying knots and releasing them around their own knees. But now the body itself is as though dead. Close up, the tiny golden bells atop the helmet can be heard tinkling; not from the shuddering of the head – they move even in the brief lapses when it is still – but from the presence of Dorje Drakden himself. The Protector is here, in the room, and as the attendants struggle to tie on the helmet, he shakes his borrowed legs and switches his head fiercely from side to side. Beneath the helmet’s red silk brim the eyes open and close in staccato blinks, as if taking in an alien environment bits at a time, before briefly relapsing into their own thoughts. Minutes pass before the cords of the helmet can be secured. When they are, they are pulled so tight that if it were only the medium acting, he would he instantly choked. But as the helmet is finally fastened, the Protector shows himself to be in full possession. Leaping up, he swings a long sword in his right hand and begins to dance. His movements are martial, wrathful, dignified. They are executed with supernormal precision. Where the kuden could not even walk for the constricting weight of the costume, Dorje Drakden can barely be contained by the body he is in. Bending straight down from the waist, he bows low, crossing both arms over his chest, then instantly springs back, the helmet’s mass counting for nothing. Waving the heavy sword in the air, he first lifts his right leg and arm, the knee and elbow bent, and then his left. This is that the he basic step of the cham or ritual dance, interspersed with bows offered out of respect to the Dalai Lama. Spinning from side to side, he repeats the gestures with such alacrity that the attendants, hovering two feet away, appear to be in another dimension of time, their steps sluggish, their movements coarse in comparison to the frenetic agility before them. They remain where they are only to keep him inside the open space at the center of the room. Three bows are completed within thirty seconds. Dorje Drakden throws the sword down and rushes up the steps to the Dalai Lama. Glancing over the seated members of the Tibetan government, he comes directly to the foot of the throne and, taking a scarf from an attendant, offers it. The Dalai Lama swiftly accepts it while the three assistants rush to place the mendel tensum, the traditional offering of the Buddha’s body, speech and mind, into his hands. The ritual cord placed over his shoulder, the Protector clasps the reliquary, scripture and image of the Buddha one at a time and offers them upwards to the Dalai Lama, who, touching them with only slightly less speed to his forehead, passes them back down to a monk on his left. In the interval, the two make direct eye contact. In that brief moment, Dorje Drakden looks up with a gentle, caring gaze, his pupils brilliantly dilated. A polished silver cup on a long silver stand, containing dark black tea, is given to him. He raises it to the Dalai Lama, who takes a small sip. In communion, he then drinks himself and steps to the right side of the throne, so that the Dalai Lama can lean over to whisper in his ear. This is the first, most secret question asked. It is quickly answered by Dorje Drakden, who then moves away to offer scarves to the main images. Rushing into the cramped space behind the throne, he hurls one twelve feet into the air, directly onto the Buddha’s begging bowl. The force and aim are astonishing, given the obvious difficulty projecting a scarf so far without its coming unraveled. The offering is repeated to the other images, and then, at the same scurrying pace, he returns to the camp stool at the centre of the temple’s floor. While he continues to drink tea in short sips, Cabinet ministers, the Chairman and the Vice-Chairman of the People’s Deputies descend to him. The immense physical upheaval of entering a small human frame has stabilized. Now the hissing breath comes in precise, neatly calibrated spasms. As the officials file by offering scarves, Dorje Drakden takes red protection cords from an attendant and knots, blesses and places them around the neck of each man. They assemble in a group on his left, and Venerable Tara, the Dalai Lama’s chief private secretary, reads from a two-foot-long scroll. It is the official petition, composed in verse, requesting the Protector to reveal specific aspects of the Dalai Lama’s, the Tibetan people’s and the government’s future. It contains no more than three questions. On this occasion the questions and the ensuing answers are public, heard by all. At other times, however, greater secrecy is required and the questions are written on small pieces of paper, which the Protector pushes under his helmet. When he is ready to respond he throws them to the floor without reading them. Now, before the answers are given, a further cham is performed. The officials return to their seats. Again Dorje Drakden takes a sword in hand and dances, flags and white cotton-topped banners fluttering in the air behind him. Helmeted, bracketed by the bristling array of wing-like pennants, standing jauntily in the white upturned boots, his golden gown and polished shield sparkling, he display the proud character of a mythic hero, an ancient warrior chieftain of the Tibetan highlands. As the second cham draws to an end, he twirls to his left, sword circling over his head, and arriving at the table holding the conical dough offerings, lops off the top of the tallest one in a swift blow. Then, flinging the weapon to the ground, he strides forth once more to offer counsel. Acting to guard all suffering creatures. To the One with Lotus in Hand I pay homage. This compassionate care is a vast excellent gathering. The prophetic answers to the questions follow, given in the order in which they were asked. The long horns emit a resounding boom. The canvas stool is brought forward by attendants, and Dorje Drakden sits, still gyrating from side to side, before the Dalai Lama’s throne. As the maroon curtain parts again, he glances toward the doorway. The medium of the Gadong Oracle enters, supported by attendants. He is starting to undergo trance. The spirit possessing him, known as Shinjachen or Wooden Bird, sometimes called Black Vulture Hat, is also a minister, like Dorje Drakden, of one of the main protective deities of Tibet, Pehar Gyalpo, the ultimate source or the oracular pronouncement. Unlike the Nechung mediums, however, those of the Gadong monastery are not monks. The mediumship is passed in a lay lineage from father to son. The present medium is a man in his mid-thirties employed as a secretary to the Dalai Lama’s private office. He has served as kuden for little more than a year and is still finding it difficult, the process of clearing the psychic channels of tsa by which the Protector will enter him, extremely painful. In addition, Shinjachen is more abrasive, manifestly wrathful spirit. Because of these factors, the two spirits have been summoned together, so that, using special methods, Dorje Drakden can assist in breaking in the new medium. As the Gadong kuden enters the hall, his breathing sounds dense and heavy. Unlike the Nechung kuden’s proficient acceptance of the deepening levels of trance, his chest heaves thickly, erratically. He is dressed in full-length gold robes, and his long black hair contrasts with the cropped head of the monk kuden, though just like the latter, as he sits on a second canvas seat five feet from the door, his breathing abruptly accelerates and grows rougher. Shinjachen appears to take possession all at once. With each inhalation the medium starts to scream in sharp pain; his eyes bulge, his body shudders wildly. Attendants strain to place his helmet on and rush him forward to offer the mendel tensum to the Dalai Lama. In a few chaotic instants, the offering is made, after which the Dalai Lama struggles to place a green blessing scarf between the kuden’s helmet and neck. But the trance is too violent; choking and convulsions have increased dangerously. The Dalai Lama delivers a curt command; the kuden’s helmet is immediately loosened and in the next moment he collapses, the trance suddenly dispelled. Unconscious and totally rigid, the Gadong medium is lifted into the air. Dorje Drakden leaps off his seat and grabbing handfuls of yellow barley grain from a monk, showers them across the medium’s prone form. And then, as the lifeless frame of the Gadong kuden reaches the door. Dorje Drakden himself vanishes; the monk’s body stretches out stiffly and is caught before it crashes to the floor by his attendants, who carry it out. The session is finished. There is silence. In the recovery room, the two mediums lie on adjacent low beds wrapped in golden brocade blankets and orange silk covers. The Gadong kuden continues to shudder and breathe spasmodically. The Nechung kuden lies perfectly still, his face placid. The aides have loosened his costume and are massaging his body. In time, he briefly opens his eyes: he is at peace. He closes his eyes and rests. Now the Gadong kuden, his trance less deep and lengthy, has fully emerged, and sits up in bed, his head in his hands, leaning forward breathing evenly. After changing their costumes, the two kudens and their staffs walk to the front door of the cathedral, enter and prostrate three times before the Dalai Lama. Dressed in plain maroon robes, the Nechung kuden seems to have been only slightly jarred – his hands do not quite match up in prayer as he prostrates – yet, as always, he has no memory of the event. The Gadong kuden, dressed in handsome green khaki chuba and red sash, looks a perfectly normal Tibetan layman. He follows the Nechung medium up to the Dalai Lama, where all receive protection cords and scarves and then return to seat themselves, looking freshly decorated, in two rows, a kuden at the head of each. The Dalai Lama continues to look down in silence. Tea is served, and the gathering of twenty drink from their bowls, each man staring at the floor by his feet. Draining the cup, the Dalai Lama leaves his throne, ties on his brown oxfords in the anteroom and, as the Indian guards snap their rifles to attention, exits the building to return to his residence. Outside, the precincts of the Central Cathedral are as empty as they were forty minutes before. A blanched grey light is filling the sky. The night has passed; it is Saturday. Within the cathedral the bright yellow barley seeds thrown by Dorje Drakden are collected, one by one, from the floor, to be kept and treasured as blessings of the protector. For 1,300 Years Tibet’s chief oracle has been consulted by the nation’s leaders on virtually every key decision of state. Although on sacred occasions the oracle would appear before up to 80,000 people in Lhasa, the inner workings of his monastery, the nature of possession and, in particular, the experiences of those closely involved have been kept strictly secret. As part of Tibet’s entry to the world, however, the Dalai Lama agreed to have some details of Nechung Monastery and the story of its most important resident, the kuden, revealed. On January 5, 1930, Lobsang Jigme, twelfth medium of Tibet’s State Oracle was born to a family of middle-class shopkeepers in Lhasa. His father died when he was still young, leading his mother to give her only child to the monkhood. The family had cousins in both the Je College of Sera Monastery, Tibet’s second-largest cloister, and the small but eminent monastery, called Namgyal Dratsang, belonging to the Dalai Lama and housed in the Potala. To decide which to approach, his mother sought a mo or divination from a renowned lama, named Demo Rinpoche. On the basis of his prognostication, Demo Rinpoche stated that the child should be sent to neither monastery. Rather, the lama related, he had “very important work” to do at Nechung Monastery and, hence, should go there. He added that the boy must be treated carefully and always kept “clean” – meaning that things should be done with decorum in his presence. On receiving this advice, Lobsang Jigme’s mother thought that perhaps her son was an incarnate lama who had, as yet, to be recognized. His sensitive, introspective nature seemed a further indication of his special nature. Securing a place at Nechung monastery, she sent him from home at the age of seven, and the young boy took up life as a getsul, or novice monk. Nechung Dorje Drayangling – The Immutable Island of Melodious Sound – as Nechung Monastery was formally called, lay four miles west of Lhasa, in a large grove of juniper and fruit trees just below Drepung Monastery. Since the seventeenth century, its 115 monks had been supported by the Tibetan government who held them responsible for keeping intact a daily link with Tibet’s main spirit Protector, Pehar Gyalpo. Believed to inhabit the spirit world invisible to humans. Pehar Gyalpo and his principal emissary to Tibet, Dorje Darkden, were contacted through eight hours of ritual conducted in four sessions a day, beginning at six in the morning and ending at ten-thirty at night. To learn the invocations, Lobsang Jigme was required to memorize five hundred pages of tantric liturgy – far less than the hundreds of books memorized by some scholars training for the Doctor of Divinity degree, but, due to the premium put on its correct incantation in ritual, a demanding task. In conjunction with recitation, he was instructed in the monastery’s unique style of chanting, the playing of religious instruments, the fashioning of elaborately sculptured offerings and cham or religious dance. Most complex were the intricate visualizations which each monk had to generate during prayers. It was by virtue of their own powers of meditation as well as the visualized offerings of blood, meat and alcohol that the Protector, it was believed, was actually summoned, imagination being the link to a higher, more refined level of reality. Lobsang Jigme soon learned that advanced practitioners whose psychic channels had been opened by years of meditation, would see Dorje Drakden, garbed in the robes of a stately monk, during daily prayers. The rest however, received their only glimpses of the Renowned Immutable One during the five official trances held each month. Through private trances often occurred at the request of the Dalai Lama, on the second day of each lunar month, without fail, Drepung’s abbot would arrive soon after sunrise for their monthly audience with the Protector. While the medium underwent trance before the two-storey-high statue of Hayagriva, a ferocious, multi-armed, multi-headed tutelary deity, poised at the rear of the monastery’s hall, the monks would seek advice on a wide range of issues affecting Drepung’s vast estates. During the next week, four government departments – Cabinet, Office of the Lord Chamberlain, and two offices of the Treasury – would submit formal requests to the monastery for their own sessions with the Protector. Meticulous records of each prophecy delivered at these meanings were kept by Nechung Monastery’s secretary, who recorded predictions on nine two-foot-long black, red-rimmed boards, oiled and dusted with limestone powder. Using an inkless bamboo pen, he wrote in the shorthand necessary to keep up with the oracle’s often rapid speech. At the conclusion of each trance, Lobsang Jigme watched as the tablets were taken to the temple’s eastern wing, where they were copied for the records of the department in attendance, as well as for his monastery’s own archives. The latter were kept in large, wood-framed books, wrapped in brocade and stored in tall, brilliantly decorated yellow cupboards. Beside them lay scrolls of golden silk upon which Nechung Monastery’s regulations had been personally composed by the Fifth Dalai Lama. Elsewhere heavy steel swords were displayed, tied in knots and given as a blessing by Dorje Drakden. The monastery’s true spiritual riches, though, consisted of a number of sacred vessels through which the Protector, without the use of a medium, was believed to communicate directly. These hallowed objects had been preserved since the dawn of Buddhism in Tibet. From his fellow monks Lobsang Jigme soon heard tales of the oracle’s miraculous abilities. Throughout Tibet’s history, he was told, the Choekyong had intervened to protect those following the path of religion from harm. In recent years, he had manifested the week-long vision in the sacred lake of Lhamo Lhatso that had revealed the birthplace of the Thirteenth Dalai Lama. When the young ruler had reached his majority and was about to assume temporal power, the Protector had exposed an assassination attempt on his life by directly challenging its mastermind, the Regent, during a trance. At the end of his reign, the oracle had bid the Dalai Lama farewell by facing him as he walked away at the conclusion of a public trance held in Norbulingka – an act performed only at final parting, which, though puzzling at the time, became clear four months later when Tibet’s ruler died unexpectedly. All these accounts showed Lobsang Jigme how intimate the connection was between his monastery and the government of Tibet. None, however, is illustrated the establishment’s vital role as clearly as the ceremonies undertaken during Tibetan New Year, the first of which brought the entire world of spirit protectors into direct contact with the affairs of men. As a state institution, Nechung Monastery stood at the apex of a nationwide system comprised of thousands of mediums and their respective spirits. The network through which the human and spirit worlds were connected, was re-enfranchised annually, in the so-called Lhatrel or God Tax. Once a year Tibet’s 120 district governors collected offerings from the mediums in their region on behalf of their spirits. Forwarded to Nechung Monastery, they were given, on the third day of the New Year, in a colossal tsog or offering ritual, to Pehar Gyalpo. After the rite, Nechung’s monks moved to the center of Lhasa for the oracle’s appearance in Tibet’s most spectacular celebration, the three-week-long Monlam Chenmo or Great Prayer Festival. At this time, over 20,000 monks, joined by thousands of pilgrims from all across the country, crowded into the capital. The Nechung medium was required to undergo trance on at least ten separate occasions. In the most dramatic event, following days of parades, athletic meetings and religious convocations, he marched in a regal procession south of the city to a field below the Potala, where, wielding his bow, sword and trident before a bonfire, he ritually dispersed the negative spirits of the old year. As Lobsang Jigme grew older, his indoctrination as Nechung monk would have progressed normally if it were not for the sudden onslaught of a strange illness around the time of his tenth birthday. In the middle of the night, he would quickly rise, don his robes and proceed, sleepwalking, out of his room. During the next year he began to show signs of irrationality during the day as well. One moment he would be conversing with the other young monks; the next, he would look into space and speak in a disjointed manner. When the fit passed, he claimed no recollection of it. But at the same time his ravings seemed to impart a logic of their own. Often he described animals – eagles, elephants and monkeys in particular. On one occasion, he told of a huge throne being built by five people. In the future, he concluded he would sit on that throne. As no external cause of Lobsang Jigme’s illness could be found, the doctors of Mendzekhang and Chokpori were unable to cure it. Their diagnosis, though, was clear. As opposed to mental illness, this was a case of spirit possession. The physicians suggested that Lobsang Jigme make a pilgrimage to Sharbumpa stupa in Phenbo, north of Lhasa. The stupa contained relics of a great lama named Geshe Sharbum, and was famous for alleviating possession. Given a fifteen-day furlough to undertake his cure. Lobsang Jigme was warned by his superiors that Nechung Monastery’s were strictly enforced; return on the appointed day was mandatory. Because of this, his stay in Sharbumpa was rigorous. To complete the number of prayers required for deriving curative benefit, he had to spend the entire day, breaking only for meals, walking around the stupa. With considerable effort, he completed the full course on time, but he experienced no relief; his affliction returned with him to the monastery. Two years later, at the age of twelve, Lobsang Jigme once more went on pilgrimage – this time to a stupa eat of Ganden Monastery. Again he performed the prescribed number of circumambulations, and again there was no result. By the age of fourteen, Lobsang Jigme’s madness had increased to the point where he could no longer attend Nechung Monastery’s daily rites. Frequently confined to bed, he lay numb and unresponsive between fits. At such times friends brought him meals, but he took no notice of them. Sleepwalking ruled his nights; during the day he experienced seizures and hallucinations and he often ran a high fever. Despite his troubles, though, he managed to complete his memorization and passed his exams. One day Lobsang Jigme was taken on a short stroll around the monastic complex by his closest companion, a young monk named Kesang. Reaching a familiar tree in front of the monastery where they normally practiced playing short horns, the two young men decided to rest. They lay down on the grass and looking into the sky, began to doze off. Suddenly, Lobsang Jigme leapt up screming. Burying his head in Kesang’s lap, he pleaded to be covered with his sen or outer robe. Kesang asked what had happened, but at first Lobsang Jigme couldn’t speak. Finally, he begged his friend to take him away from the tree, adding that he never wanted to see it again. Kesang shepherded his charge to the rear of Nechung Monastery, where their dormitories were. Once there, Lobsang Jigme told him what had occurred. He had been gazing into the top branches of the tree when two scorpions the size of yaks had appeared in the sky above. Their pincers were interlocked, and they seemed to be playing with one another. Then, without warning, they disengaged and one of them fell directly onto him. At that moment, he had screamed and buried his head in Kesang’s lap. Soon thereafter Lobsang Jigme began dreaming of scorpions coming into this mouth. Dogs appeared, scorpions in their mouths as well. His ravings became so intense that once more the monastery granted a brief leave of absence. Initially, he went to his mother’s house in Lhasa. There, he lay in bed all day, staring blankly over adjacent rooftops. As he watched he saw elephant faces appeared at the window, followed by those of monkeys. His mother and the others in the household didn’t know how to care for him. The fits had become so bad, in fact, that they wanted him to move on: his presence was disrupting the family business. With Lobsang Jigme having reached a desperate state, his mother sought advice from Kyabje Motroke Rinpoche, a great lama of the Gomang College of Drepung Monastery. She asked him if a certain technique, known as tsagak, should be applied to her son to block his psychic channels, thereby stopping the unwanted possessions. Motroke Rinpoche performed a divination and announced that under no circumstances should the procedure be followed. If it was, he said, the young man would die. He then assured her that the contrary to all appearance, the seizures were a positive sign. Lobsang Jigme had “the seed for accomplishment,” he said, and in time everybody would know what this meant. No longer able to stay at home, the young monk left in the company of Kesang’s uncle and rode thirty miles east to Ganden Monastery, where he arrived in September of 1944. Built across a 14,000-foot-high crescent-shaped ridge surrounded by a sea of peaks, Ganden was among the most beautiful monasteries in Tibet. Its scores of buildings and shrines, framed on all sides by spectacular vistas, dazzled pilgrims from across Central Asia who came to worship at the golden tomb of Je Tsongkhapa, founder of the Gelugpa sect, housed in a maroon temple in its midst. Here, Lobsang Jigme hoped to stay unnoticed in the quarters of Samling Rinpoche, an incarnate lama in his thirties who during the annual Monlam celebrations had frequently rented a room in his mother’s house. Despite Ganden’s refreshing views, Lobsang Jigme’s condition worsened after only a week. He now sensed that something very much like the trances he had often witnessed was occurring to him. Unlike the hallucinatory fits of the past five years, an episode would begin with a numbing, vibratory sensation pervading his body. His breath would shorten and begin to catch, uncontrollably, but then, thankfully, the symptoms would recede. In a few days’ time, the new sensation no longer disappeared. He now started to experience genuine trance on a daily basis. Light days brought only one trance; more often, though, he would undergo as many as two trances in the morning and three in the afternoon. Moreover, the trances soon became violent: the moment they struck he would shout and thrash wildly about with tremendous force. On their conclusion after ten minutes or so, he experienced intense pain but would have no memory of what had taken place. As Lobsang Jigme and his companions soon found out, he was at this time being forcibly prepared through lesser spirits for possession by a higher force. The process, known as tsalam jangpa or “clearing the channels,” was being undertaken in progressive stages of intensity. At the start, relatively weak spirits took possession, the trances being proportionately light. In the second stage, however, the seven Tsemars or Blazing Brothers of Samye took him turn by turn, one after another. As the Tsemars were among the most powerful spirits, the trances became violent and Lobsang Jigme experienced tremendous sickness and pain in their aftermath. As if Lobsang Jigme’s troubles were not bad enough, further difficulties now befell him. The uproar coming from Samling Rinpoche’s room provoked Ganden’s authorities to inform those caring for him that the young monk from Nechung was no longer welcome. Despite the boy’s condition, they insisted he return to his own monastery. Three times he attempted to leave, but each time he reached the gate of Ganden a particular severe fit overtook him; choking and writhing about a few seconds, he would fall unconscious onto the ground, whereupon Samling Rinpoche and Kesang’s uncle, who were accompanying him, had to carry to youth back to the hostel. But it was not only Lobsang Jigme who experienced such suffering. With the worsening of his illness a message had been sent to the young men’s mother. Distraught, she again decided to contact the high lamas for help. Setting out for Ganden, she hoped to obtain their advice and then take her son back home. She made it as far as the Kyichu River on Lhasa’s southern limits. There, just before setting foot in the coracle to cross to the far shore, she herself suffered an attack. Collapsing on the bank, her right arm, right leg and stomach gripped by intense pain, she had to be carried home on a stretcher. Every effort to alter the young monk’s situation now seemed forcibly blocked. The reason for all this appeared shortly thereafter. In the course of one of Lobsang Jigme’s heavier trances, the spirit in possession gave the following message, heard by Samling Rinpoche and all those close by: “On the fourth day of sixth month, as the sun rises above the Wangpo Ri Mountain, the Choekyong Dorje Drakden will take possession.” The news of Tibet’s chief protector entering an unknown monk’s body was almost unbelievable, yet the fourth was the following day and Wangpo Ri, the highest mountain in the area, was plainly visible through the window in Lobsang Jigme’s room. Samling Rinpoche and Lobsang Jigme’s teacher, who had come to Ganden, made a point of being by the young man’s side early the next morning. Entering the room, they found that he had been up before dawn reciting prayers. Already, he felt poorly. Then, as a faint light from the window began to replace the tranquil glow of butter lamps within, both men noticed a ball of yellow and red string, normally used to tie incense bundles, lying on the floor. For days they had been burning incense and reciting prayers whenever Lobsang Jigme went into trance; it seemed to be the only thing that helped. On seeing the string on the floor, Lobsang Jigme’s teacher leaned over from his seat to pick it up, wanting to keep the room clean. As he took the string in his hand, it suddenly turned into a live scorpion. Starting, he flung it to the floor and at that instant, Lobsang Jigme, who had been sitting quietly on his bed, leapt in trance, his face and body attenuated. Simultaneously, the sun’s first rays struck the bare rock summit of Wangpo Ri. A short while later, Lobsang Jigme collapsed, the trance ending as abruptly as it had begun. After laying him on the bed, the two men looked for the scorpion. Though it was a small monk’s cell, they could find neither it nor the ball of string. Following this incident, Samling Rinpoche began to piece together the facts. He concluded that, indeed, Lobsang Jigme was taken into the employ of Tibet’s main protector. Three factors supported the conclusion. To begin with, it had been specifically announced who the possessing entity would be. Though the message could have been misinformation from a malignant spirit, the intensity of the trance indicated the presence of an extremely powerful being. Second, the appearance of the scorpion was a familiar sign of Dorje Drakden. But the third factor was considered most significant. At that time, the current medium of Nechung Oracle, a middle-aged monk named Lobsang Namgyal, had suffered a stroke and was thought to be close to death. It seemed clear that Dorje Drakden was preparing his successor. The truth came a few weeks later. After prayers and breakfast one morning toward the end of July, Samling Rinpoche, Lobsang Jigme and his teacher decided to take a devotional walk through Ganden’s many shrines. At the heart of the monastery stood the temple containing Tsongkhapa’s tomb – one of the holiest sites in Tibet. The tomb lay within a chapel, the walls of which were lined with silver reliquaries containing the remains of successive Ganden Tipas who, as “holders of Tsongkhapa’s Throne,” had governed the Gelugpa sect for five and half centuries. At their centre was pitched a Mongolian yurt given as an offering after Tsongkhapa’s death by Sunde, Emperor of China. Tsongkhapa’s tomb lay at the rear of the yurt, behind a three-foot-high golden statue of a saint. The small party arrived at the chapel and entered the yurt at ten o’clock, well after morning prayers before the tomb had been concluded. Lobsang Jigme had been at ease throughout the devotional walk, and neither of his companions were paying close attention to him. As they passed the red-lacquared walnut pillars supporting the yurt, though, and began to prostrate before the image, the young man was struck by an extremely potent seizure. His companions tried to restrain Lobsang Jigme but were immediately thrown to the floor. From there they looked on in amazement as the young man’s body, now fully possessed, performed the unique honorific dance of Dorje Drakden before the tomb of Tsongkhapa. When the trance ended five minutes later, the boy collapsed and the two men quickly dragged his prone figure to a side chapel in the corner of the room. For half an hour after regaining consciousness, Lobsang Jigme was too nauseated to move; his head, shoulders and chest all ached intensely. His last memory had been standing before the golden tomb and beginning to pray. Then he had begun to feel as if thousands of insects were crawling over him. In the midst of the tingling vibration a stronger, more painful sensation appeared, as if his “funny bone” were being pressed throughout his body. His breathing began to accelerate, his head started to pound, his heart heaved in his chest, he felt congested, as if he had run too fast up a steep hill, and abruptly the room started to recede from his vision. The sound of the monks praying beside him grew fainter and then all combined to overwhelm him, and he blacked out. Though he realized the sensations must have occurred in a few moments, they seemed to take an unbearably long time. While walking back to their quarters, Samling Rinpoche told Lobsang Jigme what had happened afterwards. They all agreed that the event had to be kept strictly secret; an unknown adolescent monk could hardly claim, on the basis of one or two experiences witnessed by a few friends, to have been chosen as the new “receiving body” for the state oracle of Tibet. Dorje Drakden’s possessions, nonetheless, continued. Confining himself to a room for fear of being possessed in public, Lobsang Jigme felt himself entering a new stage, becoming stronger and stronger. “like a horse,” as he described it, “filling with hot blood.” At the beginning and end of each trance, he experienced severe pain. Though the trances themselves lasted only two to five minutes, he would invariably shout in agony at the top of his voice – something which the authorities of Ganden, despite the peculiarities of the case, could not permit. Forced finally to leave Ganden, the young monk could neither return to his own monastery nor to his mother’s house. His illness had made him an outcast. Through friends, he eventually found a family in Lamo, east of Ganden, who agreed to take him in. Able to depart without interference, he stayed in Lamo for a further month and a half, where he suffered, as before, not just from the newly developed trances but also from the ceaseless round of hallucinations, fits and sleepwalking that had consumed his life for six years. At this time, Lobsang Jigme’s mother received a message from Nechung Monastery. Though regretting his illness, the note nevertheless demanded his immediate return on penalty of being stuck from the monastery’s rolls. The other monks were contemplating of Lobsang Jigme’s long absence, the letter said; despite the severity of his condition there could be no exceptions to the rules. His mother replied that her son had been sick for so long, with no cure in sight, that even if his name were to be struck, it couldn’t be helped; he was not yet able to return. The monastic officials then softened their stance and tried to effect a compromise. Through his mother they informed Lobsang Jigme that for the time being his name would not be eliminated from the roster; still, he would have to return soon. Convinced that his days as Nechung monk were over and with no place to turn for help, Lobsang Jigme decided to retire to a cave and live in isolation from the world. He was just turning sixteen. Aware of the young man’s plans, Samling Rinpoche came to his aid. He offered to lead him through three-month meditation retreat at Legpai Lodru, the cave of a great hermit, above Sera Monastery, hoping that by reciting mantras and conducting purification rites some of the negative influences affecting the youth could be dispelled. Accompanied by Kesang’s uncle, they went to the cave and commenced the retreat. At the start, Lobsang Jigme was in such depressed state over the impasse his illness had brought him to that he could barely follow Samling Rinpoche’s instructions. Though he managed to fulfill the daily quotas of recitation, there was still no discernible change in his condition. Then, one morning in the middle of the retreat, he woke feeling well for the first time in years. The next day, he felt well again – and the next. Remarkably, all signs of the illness had left at once. A messenger now arrived bearing the startling information that Lobsang Namgyal, the Nechung kuden, had died. The day of the medium’s death had been the very day on which Lobsang Jigme’s illness disappeared. Furthermore, the messenger informed Lobsang Jigme, he had been dispatched by the abbot of Nechung Monastery, Nechung Rinpoche, to summon him back. None other than Taktra Rinpoche, then Regent of Tibet, had ordered him to present himself at the Norbulingka. With a single message, it seemed, Lobsang Jigme’s fate had completely reversed itself. As all those associated with Lobsang Jigme would soon learn, the Regent had consulted Shinjachen, through the Gadong medium, shortly after the Nechung kuden’s death. Asking where a new medium for Dorje Drakden could be found, he had been told that the candidate was a monk from Nechung Monastery itself. The oracle went on to say that the prospective kuden was still very young – a child of fifteen, born in the Year of the Iron Horse; his name, Lobsang Jigme. The news was greeted with a mixture of amazement and relief by Nechung Monastery’s superiors. Ironically, among the eleven mediums who spanned the three hundred years of the monastery’s existence, no kuden had risen from the ranks of its own monks; all had been chosen from elsewhere. To confirm the message, the Regent undertook a series of extremely sensitive tests. They involved placing Lobsang Jigme’s name, along with those of six other candidates – all chosen for their reputations as mediums – inside precisely weighted balls of barley paste. The balls were then put in a precious vessel and brought before three holiest images of the land. Questions posed by the highest authorities were believed to be answered by the respective Boddhisattvas through the displacement of one of the balls. Though the vessel were rotated to produce a gentle momentum, there was an unmistakable pattern by which a single ball would be ejected. Out of the seven balls placed in the vessel by the Taktra Regent, the one with Lobsang Jigme’s name on it came out on all three occasions. Nechung Rinpoche was then requested to have the young man brought immediately to the Regent. Lobsang Jigme descended from his retreat a day after a messenger’s visit. Arriving in Lhasa, he was met by Nechung Rinpoche and a delegation from the monastery, in whose company he rode two miles west to the summer palace. Leaving their mounts by the great stone lions flanking its front gate, the party was received in the gardens beyond and led down a narrow lane running between tall, shady trees, their leaves turned red and gold in the late autumn, to the Shabten Lhakhang, the temple in which the Regent received visitors. Directed into an ornate receiving room Lobsang Jigme nervously took a long white scarf and walked forward. It was the last thing he remembered. As he came before the Regent’s high throne and offered the scarf, Dorje Drakden instantaneously took possession, greeting Taktra Rinpoche through the new Kuden in a direct demonstration of his validity. The trance lasted for five minutes, during which time Dorje Drakden spoke to the Regent in private. At its conclusion, Lobsang Jigme collapsed and was returned to Nechung Monastery. There, he was housed in separate quarters while being subjected to a series of tests to determine if indisputably it was a truly Dorje Drakden taking possession and not another strong, but lesser spirit. The need to thoroughly test the authenticity of the Nechung kuden had, for centuries, been a critical concern of the Tibetan government. As the most delicate policies of state, both domestic and foreign, were involved with the oracle, the possibility of a leak, either from a malignant spirit taking possession (and subsequently relating information via another medium) or from the medium himself retaining some trace memory of the trance, was ever-present. So, too, was the danger of a garbled or mistaken transmission. To protect against the latter, the level of the medium’s trance was closely observed, a complete possession, inducing unconsciousness, being the ideal state. Such possession could occur only if the 72,000 psychic channels upon which, according to tantric theory, consciousness is mounted in the human body were cleared of all obstructions. In such a case trance would be undergone swiftly, continuing without fluctuations or other irregularities. Though Lobsang Jigme’s trances revealed him to be very pure “vessel,” the next task, that of checking whether or not if it was in fact Dorje Drakden who possessed him, required, following preliminary observations, three levels of tests. Initially, four signs of Dorje Drakden’s immense power were sought: swelling of the medium’s body up to two inches, effortless support of the heavy costume, ringing of the golden bells on the helmet’s top and shuddering of the mirror on the chest from the increased heartbeat. The character of the possessing spirit was then observed. Dorje Drakden’s cham was particular to him, as was the fact that his fierce, prideful attitude gave way to humility only if the Dalai Lama, his picture or an article of his clothing was present. Otherwise the spirit minister demanded complete subjugation from all those in attendance. With these factors present, three categories of tests, known as outer, inner and secret, were undertaken, In the other test, the medium was presented during trance with sealed boxes and requested to name their contents. This exam was considered easy, as the majority of spirits were believed to possess a minor form of clairvoyance. It was followed by the inner test, in which the possessing spirit was requested to quote verbatim prophecies given by the Protector on specific dates in the past. With hundreds of prophecies on file, all imparted in Dorje Drakden’s poetic, often cryptic style, this test was virtually impossible to pass if the Protector himself was not present. The two tests comprising the secret category, however, were believed definitive. Prior to the trance the kuden’s breath was checked to make sure that it had no odour. During trance it was examined again. If Dorje Drakden was in possession, the breath would invariably have a strong scent, similar to that of alcohol but described as actually being that of nectar. At the moment Padmasambhava had converted the Five Kings, in the form of the eight-year-old novice, to the Dharma, he had anointed the child’s tongue with a few drops of nectar. Its odour was maintained by the spirit as a sign that his vows were being upheld. While exacting allegiance, Padmasambhava had placed the blazing tip of his dorje on the head of the kneeling child. As the trance ends and the thickly padded helmet is quickly removed before the kuden chokes, Dorje Drakden’s possession is revealed in the well-defined imprint of a dorje, clearly visible for a matter of minutes, on the crown of the medium’s head. Successfully passing all of the tests, Lobsang Jigme was publicly proclaimed, early in 1945, to be the new medium of Tibet’s State Oracle. On the day of his investiture he took part in an elaborate ritual at Nechung Monastery after which the abbot conducted him to the kuden’s personal residence, a large well-appointed building within the monastic complex. Here, cared for by a carefully chosen staff, he spent most of his time engaged in the practiced of deity yoga, pursuing meditation techniques which enabled him to enter trance with consistently less discomfort. Collecting the ample salary given to all Nechung Kudens by the government, he was treated with the utmost respect, on a par with that accorded to high lamas. Most rewarding of all, for the first time since the age of ten, Lobsang Jigme continued to enjoy good health. The position of Nechung Kuden, however, was neither easy nor even necessarily desirable. It held the potential of a high as well as an ignominious fate. Many kudens had suffered the latter; only a few had achieved the former. The very first kuden, appointed at the monastery’s founding in the seventeenth century, had been executed when, through possession by a lesser spirits, secret government information had been revealed to the public. Though no such drastic measure had occurred since, two of the three kudens preceding Lobsang Jigme had been disgraced, fired from their posts, after their meditation practice had deteriorated to the point of interfering with the coherence of their trances. 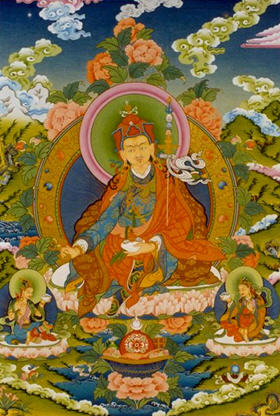 Shakya Yarpel, though, the renowned kuden prior to them, had been so beloved by the Thirteenth Dalai Lama for the charity of his possessions that he had been accorded honours above even those granted the Prime Minister and Cabinet, actually being conveyed when he traveled in a pep jam, the gold palanquin normally reserved solely for the Dalai Lamas and Regents. Aware of the difficulty of the post, Lobsang Jigme’s predecessor, had run away on being singled out during a trance of the Gadong Oracle as the new Nechung kuden. Nonetheless, unable to prevent his destiny, he had been possessed by Dorje Drakden and, until his death (attributed by some to the immense strain placed on his heart by possession), accepted the role. Lobsang Jigme’s favourable response to the post was augmented by a sense of personal affinity with Dorje Drakden himself. For the first three years following his recognition, on the night preceeding a scheduled trance, the same odd event would inevitably occur. Past midnight, a loud banging would be heard in Lobsang Jigme’s room, waking both him and his attendants from sleep. Unable to find a source for the commotion, the aides would turn to the kuden, who by then would be staring at the door and laughing. It was clear, Lobsang Jigme felt, that these visits were being paid as a welcome of sorts to the new kuden by the followers of Dorje Drakden, due to enter him in trance in a few hours time. On only two occasions a year did Lobsang Jigme experience serious discomfort in his occupation. At these times, two of the Five Kings, the superiors of Dorje Drakden and Shinjachen, would come with the ministers and very briefly take possession of the Nechung and Gadong mediums. 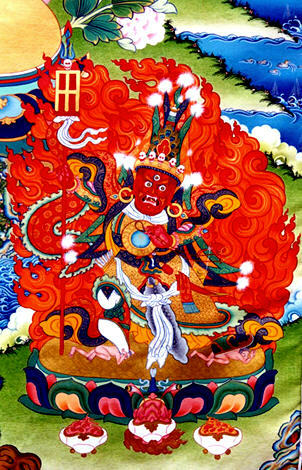 In the case of the Nechung kuden, Trinley Gyalpo, the Northern King of Action, would follow Dorje Drakden into the medium’s body. This happened on the second day of the first month and again on the twenty-fifth day of the third month. Initially, Dorje Drakden took possession. Then, within “the stomach,” as it was metaphorically phrased, of the Renowned Immutable One, Trinley Gyalpo would manifest himself. Without the intervening energy of Dorje Drakden to modulate the current of White Pehar, as Trinley Gyalpo was often called, the medium would immediately die. So much was made clear during the single minute – and sometimes only a few seconds – of possession. At the moment of entry, the medium’s body, already swollen from Dorje Drakden, would become rigid, arms and legs outstretched, blood gushing from his nostrils. Those present would quickly offer a scarf in honour of Pehar Gyalpo, after which the Northern King would depart. Dorje Drakden remained in possession while the blood stopped flowing and the body was restored, and then he too would leave. Regardless of the country’s own internal decline, Dorje Drakden did not neglect to warn of the external threat from China. The Dalai Lama vividly recollected the first such indication, which occurred in 1945.”On that occasion,” he related, “when Nechung was questioned concerning the welfare of Tibet, he didn’t say a thing. Instead, he faced eastward and began shaking his head up and down. It was quite frightening, because for an ordinary person the helmet would have broken his neck. At least fifteen times he did this – very violently – and then the trance went off.” In 1945, no one in Tibet imagined that Chinese aggression, driven off more than three decades earlier, would soon reconstitute itself. In 1948 – two years before the invasion – Dorje Drakden directly warned that in the Year of the Iron Tiger – 1950 –Tibet would face extreme danger. He instructed that a specific shabten or religious activity be undertaken, one component of which was the construction of a large chorten at a designated spot. Such acts could not eliminate the threat of conquests, but it was believed, as part of the Protector’s efforts, that they would deter the invasion for a good number of years, during which time the situation might improve on its own, so that when the onslaught did come, it would do so with considerably less destructive force. However, in the self-seeking climate of the time, this and other advice was ignored. As the invasion approached, Dorje Drakden repeatedly alluded to the need for the Dalai Lama to take temporal power. Finally, in November 1950, following Lhasa’s first word of the attack. Shinjachen insisted that Tenzin Gyatso take control. Confused and defeated, the government had to agree. In 1951, Lobsang Jigme inexplicably fell ill once more. This time, he contracted arthritis, due, perhaps, to physical stress from repeated possessions. Soon all his major joints were so inflamed that he could no longer walk and had to be supported by two helpers. The doctors at the medical colleges could not effect a cure. Again, he lived in daily pain – save for those occasions when he underwent trance. In the meantime, Dorje Drakden continued to use him, giving the vital instruction that the Dalai Lama go to India in 1956 to forge the first contacts with Nehru and the Indian government, on which, subsequently, the Tibetan refugees’ survival was to depend. Then, in 1958, a year before the Dalai Lama’s flight, the Choekyong prophesied: “In this great river where there is no ford, I, Spirit, have the method to place a wooden boat.” His meaning was clear; the Dalai Lama would have to flee, guided by him through the impassable “river” of Chinese troops. 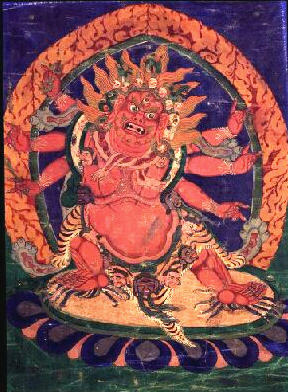 Hayagriva – wrathful emanation of Avalokiteshvara that Padmasambhava used during his meditations to subdue the Pehar Spirit Brothers and spirit minister Nechung Dorje Drakden. Before the end of the trance, the senior attendants of the Nechung Kuden stepped forward to ask Dorje Drakden what should be done for the medium himself. Dorje Drakden replied that after Lobsang Jigme recovered from possession, he should leave Drepung immediately and begin walking south. He was to follow the same route the Dalai Lama had taken. The Protector guaranteed that nothing untoward would happen, and then. Wrapping blessed grains in a white scarf which he gave to the attendants, he instructed them to burn a single grain whenever difficulty was encountered. Whatever thoughts occurred to them at the moment, he said, they should immediately act on. When Lobsang Jigme regained consciousness, he looked up from the bed on which he had been placed and saw the small group of monks weeping over him. He inquired if shells had fallen on Drepung and if so whether or not any of them had been hurt. They replied in the negative. ”Then why are you all crying?” he asked. After conveying Dorje Drakden’s message, the senior attendants said, “This is the Choekyong’s advice, but how can I follow it? You are a sick man. During the celebration of the Buddha Jayanti in 1956 you went by car through India and even under those conditions suffered tremendously. Now we have to walk and ride for weeks. How can we possibly cope with this problem?” As Lobsang Jigme had no answer for them, one and all lapsed into silence, pondering Dorje Drakden’s other statement: the stunning news of the Dalai Lama’s flight from Norbulingka – unknown to Tibetans and Chinese alike until the following week. Lobsang Jigme’s own escape began the same day. In extreme pain, he spent two months walking from Drepung, through the heart of the fighting in Lhoka, to India. On numerous occasions he just missed capture by the PLA, who were consistently delayed by a series of unexpected events. 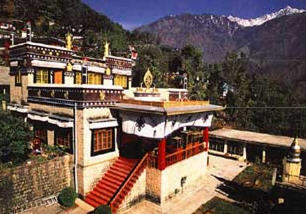 After arriving safely in the NEFA and being processed through Missamari, he went to see the Dalai Lama in his temporary quarters at Birla House in Mussoorie. Thereafter, he took up his duties once more as a medium, alongside the Gadong kuden, also in exile. Six out of Nechung Monastery’s 115 monks managed to escape Tibet. In 1962, Nechung Rinpoche, the monastery’s abbot, fled, bringing with him the most precious vessel of the Protector, originally stored at Samye, thirteen centuries before. A few years later Dr. Yeshe Dhonden succeeded in curing Lobsang Jigme of his incapacitating arthritis and by 1983, with Nechung Monastery’s two most prominent figures actively at work, dozens of young monks had been ordained and a new monastery built across from the Library of Tibetan Works and Archives in Gangchen Kyishong. Here, once more, the daily invocations of Dorje Drakden proceeded with a full complement of monks – much of the refugees’ progress being attributed by them to the ongoing guidance of their Protector over a quarter century of exile. This entry was posted on Saturday, January 30th, 2010 at 1:35 pm	and is filed under Dharma Readings. You can follow any responses to this entry through the RSS 2.0 feed. You can leave a response, or trackback from your own site. I enjoyed reading this article very much. The author gives a very interesting and detailed description of the Nechung and Gadung oracles taking trance. He also gives an account of the background of the medium, Losang Jigme and his incredible training as the Nechung oracle. This is a remarkable story of a young monk being prepared for his role and service as a kuten. His loyalty to the Dalai Lama is praiseworthy, something to be marveled at. Precious info. Lucky myself I recently found your website inadvertently, using this program . taken aback the reason the following incident failed to taken place previous! We saved as a favorite them. you writing this article plus the rest of the website is very good. Through this you will learn techniques to stabilize the patient and assure swifter recovery. What’s up,I check your blog named “The Wheel of Protection : Dorje Shugden The Protector Of Our Time” daily.Your humoristic style is awesome, keep doing what you’re doing! And you can look our website about تحميل مهرجانات شعبى.